3 WHAT IS A CHICANO? RUBEN SALAZAR A Chicano is a Mexican American with a non-Anglo image of himself. He resents being told Columbus "discovered" America when the Chicano ancestors, the Mayans and the Aztecs, founded highly sophisticated civilizations centuries before Spain financed the Italian explorer's trip to the "New World". Chicanos resent also Anglo pronouncements that Chicanos "culturally deprived" or that the fact that they speak Spanish is a "problem". Chicanos tell you that their culture predates that of the Pilgrims and that Spanish was spoken in America long before English and so the "problem" is not theirs but the Anglos who don't speak Spanish. The Chicanos say that Anglos are sometimes Spanish-oriented at the expense of Mexicans. They complain that when the Governor dresses up as a Spanish nobleman for the Santa Barbara Fiesta he's insulting Mexicans because the Spanish conquered and exploited the Mexicans. It's as if the Governer dressed up like an English Redcoat for a Fourth of July parade. BRAINWASHED When you think you know what Chicanos are getting at, a "Mexican American" will tell you that Chicano is an insulting term and may even quote the Spanish Academy to prove that Chicano derives from chicanery. A Chicano will scoff at this and argue that Mexican Americans have been brainwashed by Anglos and that they're Tio Tacos (Uncle Toms). This type of Mexican American, Chicanos argue, don't like the word Chicano because it's abrasive to their Anglo-oriented minds. What, then, is a Chicano? Chicanos say that if you have to ask you'll never understand, much less become a Chicano. Actually the word Chicano is as difficult to define as "soul". DEFINITION For those who like simple answers, Chicano can be defined as short for Mexicano. 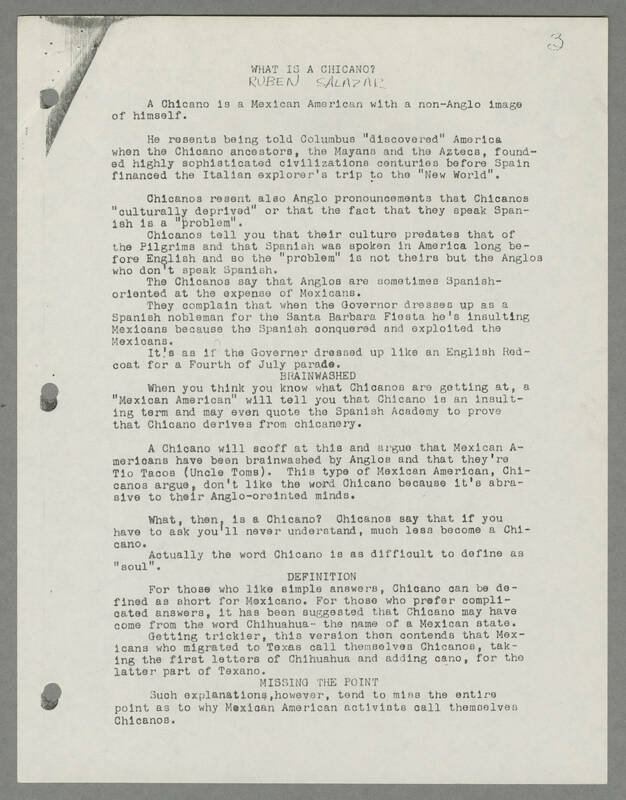 For those who prefer complicated answers, it has been suggested that Chicano may have come from the word Chihuahua - the name of a Mexican state. Getting trickier, this version then contends that Mexicans who migrated to Texas call themselves Chicanos, taking the first letters of Chihuahua and adding cano, for the latter part of Texano. MISSING THE POINT Such explanations,however, tend to miss the entire point as to why Mexican American activists call themselves Chicanos.